Need help pulling wire? Wylaco can help! Specifications: Application : For Pushing And Pulling WiresOver Long Distances Collapsed Length : 50.000 IN (1270.000 MM) Diameter : 2-1/4 IN (57.000 MM) Extended Length : 24.000 FT (7.310 MR) Replacement Part : 10453 Replacement Hook Type : Non Conductive Weight : 4-1/4 LB (1.900 KG) Description: Designed specifically for pushing and pulling wires o..
BARGAIN BIN ITEM Greenlee 542-150 Specifications: Width: 3/16" (4.7 mm) Length: 150' (45.7 m) Capacity: 400 lbs. (1.7 kN) maximum design strength Greenlee 542-150 Features: 12" (305 mm) case has high-impact nylon, one-piece handle for maximum durability, long life, and easy, comfortable use. 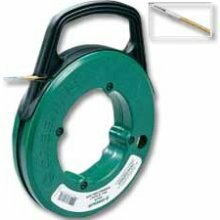 Non-conductive fiberglass tape with ..
Greenlee 542-200 Specifications: Width: 3/16" (4.7 mm) Length: 200' (76.2 m) Capacity: 400 lbs. (1.7 kN) maximum design strength Greenlee 542-200 Features: 12" (305 mm) case has high-impact nylon, one-piece handle for maximum durability, long life, and easy, comfortable use. Non-conductive fiberglass ..
Greenlee 542-250 Specifications: Width: 3/16" Length: 250' Capacity: 400 lbs. (1.7 kN) maximum design strength Greenlee 542-250 Features: 12" (305 mm) case has high-impact nylon, one-piece handle for maximum durability, long life, and easy, comfortable use. Non-conductive fiberglass tape with lo..
Greenlee FP18 Specifications: Diameter: 2" Material: Fiberglass Color: Green Extended Length: 18' Collapsed Length: 27" Greenlee FP18 Features: Push or pull wires over long distances including suspended ceilings, sub-floors, crawl spaces and attics. Non-conductive, high.. Features: Used for general fishing in conduit Maximum durability Improved low profile tip for easy fishing through all sizes of conduit Available in 50'(15.2m), 65'(19.8m), 125'(38.1m) and 240'(73.2m) lengths 1/8", 1/4" and flat steel profiles to accommodate different fishing situations Advanced comfort grip and rugged case design Superior r..
Greenlee 436-5 Specifications: • 50' x 3/16" (15.2 m x 4.8 mm) diameter Nylon Fish Tape in Winder Case • Capacity: 3/16" (4.8 mm) dia. - 250 lbs. (1.1 kN) maximum design strength • Weight: 2 lbs. 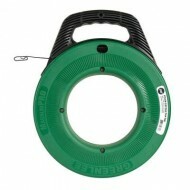 (0.9 kg) Greenlee 436-5 Features: • Co-extruded curl-resistant nylon fish tape fishes equally well in large and small conduit. • High..
Klein Tools 56001 Depthfinder High Strength 1/8" Wide Steel Fish Tape - 50' Klein Tools, Inc. represents much more than Klein pliers. The company's product line has broadened to include virtually every major type of hand tool used in construction, electronics, mining, and general industry in addition to the electrical and telecommunications fields. Kle..
Klein Tools 56002 Depthfinder High Strength 1/8" Wide Steel Fish Tape - 65' Klein Tools 56002 Depthfinder High Strength 1/8" Wide Steel Fish Tape - 65' Features: Permanent, laser etched 1' increments on the tape allow you to more accurately measure the depth of conduit runs and determine the amount of tape left to pay out. ..
Klein Tools 56003 Depthfinder High Strength 1/8" Wide Steel Fish Tape - 125' Klein Tools 56003 Depthfinder High Strength 1/8" Wide Steel Fish Tape - 125' Features: Permanent, laser etched 1' increments on the tape allow you to more accurately measure the depth of conduit runs and determine the amount of tape left to pay out ..
INCLUDES: (1) High Strength Steel Fish Tape FEATURES: Permanent, laser etched 1' increments on the tape allow you to more accurately measure the depth of conduit runs and determine the amount of tape left to pay out. The 13" case diameter means you can reel in 15% more tape in a single revolution than similar sized 12" tapes, sav..
Klein Tools 56100 12' Fish Rod Set Klein Tools, Inc. represents much more than Klein pliers. The company's product line has broadened to include virtually every major type of hand tool used in construction, electronics, mining, and general industry in addition to the electrical and telecommunications fields. Klein Tools 56100 12' Fish Rod Set Features: ..
Klein Tools 56101 24' Fish Rod Set Klein Tools, Inc. represents much more than Klein pliers. The company's product line has broadened to include virtually every major type of hand tool used in construction, electronics, mining, and general industry in addition to the electrical and telecommunications fields. Klein Tools 56101 24' Fish Rod Set Features: ..
Klein 50355 Specifications: Weight: .33 Klein 50355 Features: For flat-steel or stainless steel fish tape. Compact size —fits in your pocket. HI-VIZ Yellow makes it easy to spot on the job. Precision metal die-cast body provides a lightweight, rugged, and durable grip that comfortably fits in yo.. Features 4 different types of fish tape: Flat-steel, Klein-Flex spiral wound, Klein-Lite non-metallic, and stainless steel. Extra-large Grip-It handle is designed to be gripped from different angles, even with a gloved hand. Color-coded handles for easy identification: Flat-Steel (black), Klein-Flex (orange), Klein-Lite (blue), stainless steel (gray). HI-VIZ orange case makes fish ta.. Features 4 different types of fish tape: Flat-steel, Klein-Flex spiral wound, Klein-Lite non-metallic, and stainless steel. Extra-large Grip-It handle is designed to be gripped from different angles, even with a gloved hand. Color-coded handles for easy identification: Flat-Steel (black), Klein-Flex (orange), Klein-Lite (blue), stainless steel (gray). HI-VIZ orange case m..
Klein 50211 Flat-Steel Fish Tape W/ Reel 120' Features: 4 different types of fish tape: Flat-steel, Klein-Flex spiral wound, Klein-Lite non-metallic, and stainless steel. Extra-large Grip-It handle is designed to be gripped from different angles, even with a gloved hand. Color-coded handles for easy identification: Flat-Steel (black), Klein-Flex (orange), Klein-Lite (blue), stainle..
Klein 50211 Stainless Steel Fish Tape W/ Reel 120' Features: 4 different types of fish tape: Flat-steel, Klein-Flex spiral wound, Klein-Lite non-metallic, and stainless steel. Extra-large Grip-It handle is designed to be gripped from different angles, even with a gloved hand. Color-coded handles for easy identification: Flat-Steel (black), Klein-Flex (orange), Klein-Lite (blue), st..
Klein 50221 Flat-Steel Fish Tape W/ Reel 200' Features: 4 different types of fish tape: Flat-steel, Klein-Flex spiral wound, Klein-Lite non-metallic, and stainless steel. Extra-large Grip-It handle is designed to be gripped from different angles, even with a gloved hand. Color-coded handles for easy identification: Flat-Steel (black), Klein-Flex (orange), Klein-Lite (blue), stainle..